Hello everyone and welcome once again to Beauty Brawl! Today is December 3rd, so we are looking at highlighters! If you want to know what Beauty Brawl is all about, check out my original post here. You can see what mosturiser I chose for day one over here, and have a look at the eyeshadow palette I chose yesterday here! With all that out of the way, let’s look at what I chose for today. I wanted to try and keep most of this at high street prices to make it more accessible for people to try. 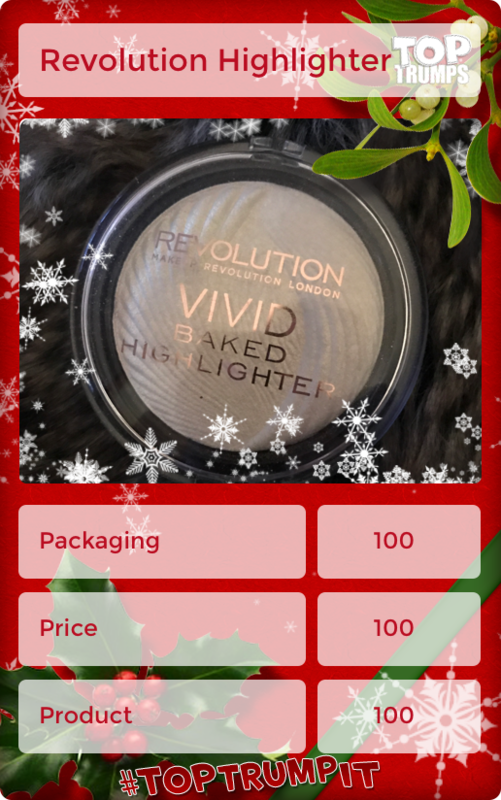 With that in mind, I’ve chosen one of my favourite highlighters – Revolution Vivid Baked. This is £3 on Superdrug. I actually use this highlighter every day, so I’ve cheated a little in the sense that it’s not a new product to me. However, I really wanted to include this because I just think it’s the best highlighter for the price. This is such a pigmented product. Incredibly incredibly pigmented. I have used this particular one now for over a month and it still looks untouched. Such a small amount on a fan brush really pops on your face. Packaging – 100/100. I have no problems at all with the packaging in this. I like that it has a clear plastic lid. Honestly it provides no benefits, but I like that I can see the gorgeous product through it. It’s easily opened, small enough to pop in your bag and travel with but also contains an amazing amount of product. Price – 100/100. This is £3. Really you cannot go wrong with this. I’ve been using it for over a month and it still looks brand new. I can honestly see this lasting me well over a year which makes it absolutely incredible for £3! Product – 100/100. I love this highlighter. It’s the perfect colour for everyday use, can be used in any season and with any makeup look. A small amount goes a long way, and you can really layer it up if you want a really ‘over the top’ highlighter look. I can’t fault the product, it’s perfect. It doesn’t cake, it doesn’t have any fallout and it looks so natural on the skin. So that’s it for today guys! Keep tuned to see what else is in store, I found some amazing ones!